Great movie. 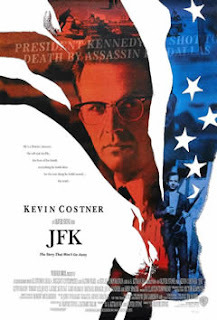 True or not (and I do NOT want to open up that debate) it presented the ideas in a way that made you want to believe in the grassy knoll. I agree with you take on the pacing too. There was enough always happening to keep you watching. The "Back and to the Left" sequence was one that still sticks with me. @Jason: Thanks for stopping by. I appreciate it. Yeah, it is a great movie, and the pace is just tremendous. There's something happening ALL THE TIME, and there are rapid-fire moments when you're trying and catch up. James: thanks for stopping by, and for the comment. The challenge is a daunting one, to say the least, but so far, so good. And by all means, please do suggest some films for me to watch. I'm always looking for new ideas!